After Babur's conquest of Delhi, he erected a mosque at Panipat to celebrate his victory over Ibrahim Lodi. A second mosque, known as the Babri Masjid, was built in Ayodhya (on a demolished Hindu Ramjanmabhumi temple). This was the construction which was so famously - and controversially - demolished by Hindus in 1992. A third mosque also built by Babur during the same period was constructed in Sambhal, at Distt Moradabad. Some of the earliest and most characteristic examples that remain of early Mughal architecture were built in the short reign of Emperor Sher Shah Suri (1540–1545), who was not even a Mughal; they include a mosque known as the Qila i Kuhna (1541) near Delhi, and the military architecture of the Old Fort in Delhi and Rohtas Fort, near Jhelum in present-day Pakistan. The emperor's mausoleum, octagonal in plan and set upon a plinth in the middle of an artificial lake, is in Sasaram, and was completed by his son and successor, Islam Shah Suri (1545-1553). The Emperor Akbar (1556-1605) built largely, and the style developed vigorously during his reign. 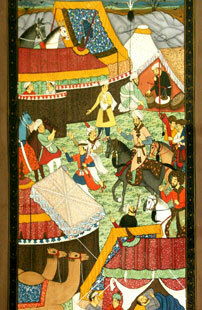 As in the Gujarat and other styles, there is a combination of Muslim and Hindu features in his works. Akbar constructed the royal city of Fatehpur Sikri, located twenty-six miles (forty-two kilometres) west of Agra, in the late 1500s. The numerous structures at Fatehpur Sikri best illustrate the style of his works, and the great mosque there is scarcely matched in elegance and architectural effect; the south gateway is well known, and from its size and structure it excels any similar entrance in India. The Mughals built impressive tombs, which include the fine tomb of Akbar's father, Humayun, and Akbur's tomb at Sikandra, near Agra, which is a unique structure of the kind, and is of great merit. Under Jahangir (1605–1627) the Hindu features vanished from the style; his great mosque at Lahore is in the Persian style, covered with enamelled tiles. At Agra, the tomb of Itmad-ud-Daula, which was completed in 1628, was built entirely of white marble and covered wholly by pietra dura mosaic. It is one of the most splendid examples of that style of ornamentation to be found anywhere. Jahangir also built the Shalimar Gardens and its accompanying pavilions on the shore of Dal Lake in Kashmir. He even built a monument to his pet antelope, Hiran Minar, in Sheikhupura (now in Pakistan) and due to his great love for his wife, after his death she went on to build his mausoleum in Lahore. The Taj Mahal, the 'teardrop on eternity', was completed in 1648 by Emperor Shah Jahan in memory of his wife, Mumtaz Mahal. It is completely symmetric, other than the sarcophagus of Shah Jahan, which is placed off centre in the crypt room below the main floor. This symmetry extended to the building of an entire mirror mosque in red sandstone, to complement the Mecca-facing mosque place to the west of the main structure. The Taj Mahal (1630-1653) in Agra and the Shalimar Garden (1641-1642) in Lahore (now in Pakistan), are two sites which are on the world heritage list of UNESCO. One can see the architectural similarities and the love for water that the Mughals expressed in many of their buildings. The Taj is considered to be one of the most beautiful monuments of love and is one of the Seven Wonders of the World when it comes to tourism. In Aurangzeb's reign (1658–1707) squared stone and marble gave way to brick or rubble with stucco ornament. Srirangapatna and Lucknow have examples of later Indo-Muslim architecture. 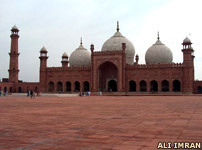 He added his mark to the Lahore Fort and built one the largest mosques in the city, called the Badshahi Mosque. He also built one of the thirteen gates, and it was later named after him, Alamgir. Mughal gardens are a group of garden designs which originate from the Islamic Mughal Empire. The style was influenced by Persian and Timurid gardens. Significant use is made of rectilinear layouts within walled enclosures. Typical features include pools, fountains and canals. The founder of the Mughal empire, Babur, described his favoured type of garden as a charbagh. This word developed a new meaning in India because, as Babur explained, India lacked the fast-flowing streams required for the Central Asian charbagh. The Agra garden, now known as the Ram Bagh, is thought to have been the first charbagh. India and Pakistan have a number of Mughal gardens which differ from their Central Asian predecessors in their highly disciplined geometry. Early textual references to Mughal gardens are found in the memoirs and biographies of the Mughal emperors, including Babur, Humayun and Akbar. Later references are found in the accounts of India which were written by European travellers, such as Bernier. The first serious historical study of Mughal gardens was written by Constance Villiers-Stuart, with the title, Gardens of the Great Mughals (1913). Her husband was a colonel in Britain's Indian army. This gave her a good network of contacts and an opportunity to travel. During their residence at Pinjore Gardens, Mrs Villiers-Stuart also had the opportunity to direct the maintenance of an important Mughal garden. Her book makes reference to the forthcoming design of a garden for the Government House in New Delhi (now Rashtrapati Bhavan). She was consulted by Edwin Lutyens and may have influenced his choice of the Mughal style for this project. Recent scholarly work on the history of Mughal gardens has been carried out under the auspices of Dumbarton Oaks (including Mughal Gardens: Sources, Places, Representations, and Prospects, edited by James L Wescoat and Joachim Wolschke-Bulmahn) and the Smithsonian Institution. 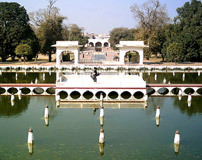 Some examples of Mughal gardens are the Shalimar Gardens (Lahore) and Shalimar Gardens (Kashmir). Text copyright © Tushar Ingle. An original feature for the History Files.